Modern stained glass windows designed by Penelope Neave and given by Elspeth Riley-Smith of Brewhurst in memory of her parents and husband, add a feeling of welcome, light and warmth. The design of the reredos curtain includes a peacock (for Paradise), doves (for peace), the Paschal Lamb and cross, which is the sign of St John the Baptist, the Sussex Coat of Arms, and an L for Loxwood. The electronic organ was installed in 2005 and a new oil fired boiler in 2011. 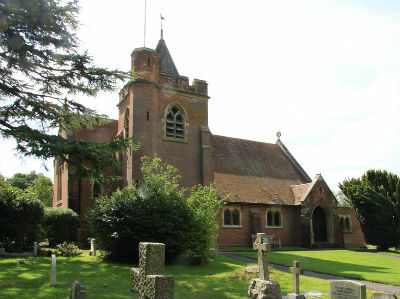 The church has excellent acoustics and is equipped with a sound system with a relay to the 'Loxwood Church Room', which, adjoining the church, was built in 1985. 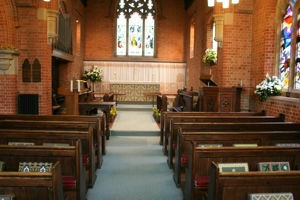 The Church Room creates a space for creche, children's groups, refreshments for after church services, and for many other non-church activities. The room has a small kitchen and an accessible WC. 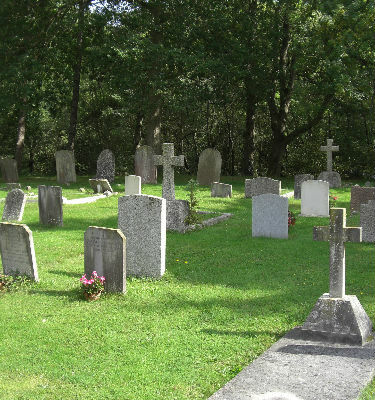 The churchyard is open for burials and is being actively managed to maintain its rural nature and includes the addition of a Garden of Remembrance in 1999. The construction of the first Norman church, consisting of nave and chancel, took place in approximately 1100. 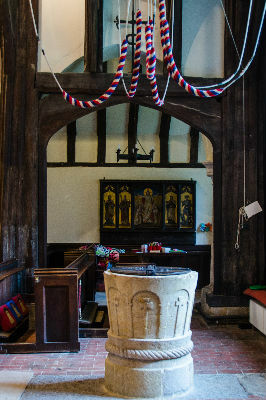 Our beautiful font dates back to around this time, probably about 1080, and is one of the finest and best preserved in Surrey. It is marked with a Maltese Cross on a long stem, defining it as unmistakably Norman. insertion of the rounded Norman pillars. A fire in the 16th century destroyed the north aisle, and it was only in 1842 the then RectorRev. J. Sparkes, when knocking off some plaster, discovered the three ancient Norman pillars in a state of perfect preservation and so rebuilt the north aisle dismantling and replacing the 16th century north porch. The outline of the east window dates back to 1320, although the glasswork, imported from Normandy was constructed in 1850. 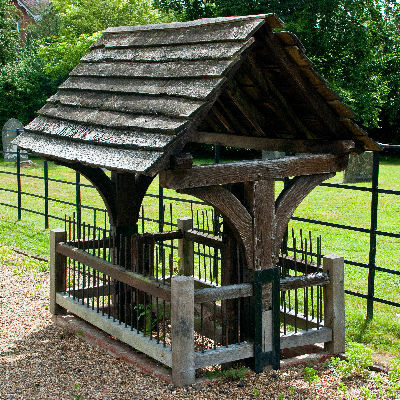 Outside the church stand the village stocks, one of only two complete sets of stocks in Surrey. 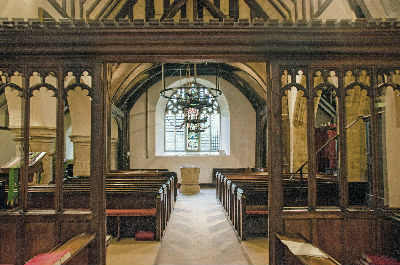 Any boy who dared laugh in church was confined in these stocks, given a thrashing, and left to meditate on his sins until the next service of the day. As the current vicar, I'd like to say that we still practise this same discipline, but alas we do not - some of our All Age services now would've caused quite an uproar back then! worked into a series of hollow mouldings. The framework of the bell-chamber and spire is an elegant display of mediaeval carpentry dating from around 1500. Watching the bell ringers 'in church' at the western end of the nave provides quite a unique atmosphere. be found just a short walk down Rosemary Lane. 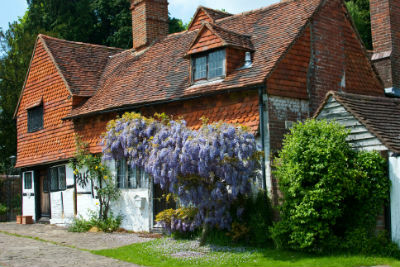 Opposite the church can be found 'Alfold Church Room', the middle of a beautiful row of terracotta tiled terrace cottages. The Alfold Church Room houses our church office, choir vestry and church hall, which is used for children's groups, and can be hired out for non-church activities. 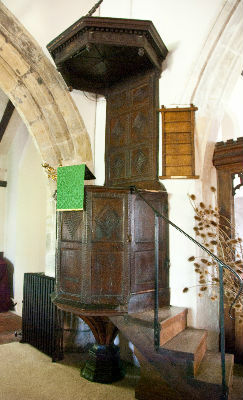 It's also worth mentioning our beautiful Jacobean pulpit and sounding box. Merely looking at it one gets a sense of pride in its workmanship and carving. If visiting St Nicholas church building please do take one of our little booklets 'A History of Alfold Church', where you'll find a much more detailed history of the church.